By Rusty Nate: Having watched the weekend’s events I thought I would put something to paper and just review the bouts as they happened. I was present this weekend at the Excel event for George Groves’ next installment and what a great show it was regardless of the Burns fight being cancelled. This was a great fight. Groves really impressed me with his increased speed in this fight. He put together some great combinations and was able to handle Johnson in a better fashion than both Bute and Froch managed to. I am not saying Groves is at that level just yet but he is definitely moving in the right direction and it wont be long for him now I don’t think. His negatives were complacency, he appeared on a few occasions to maybe punch himself out a little bit and leave himself open to Johnson’s constant pressure. Against other fighters this may have been the way to go but I just feel that knowing how hard Johnson is it was a bit over aggressive. Groves maybe could have taken less punches if he had not tried so hard to stop him. But this is a learning curve and I think the fight would have benefited Groves massively. A great fight and good performance. Just a mention on the undercard of a future one to watch, Frank Buglioni! He looks the real deal after just 7 fights and also has a huge following already, a definite future crowd favorite and good potential. This was an interesting fight. A good solid performance from Khan I thought. We all know why this was the fighter he picked to fight. An unbeaten confident fighter in Molina who was noticeably shorter, physically smaller and slower than Khan with a weaker punch than most Welterweights. It was a perfect choice for a confidence fight for Khan having lost his last two fights. But what did it really show us? Well Khan to his credit did box in a much more restrained way than he has in his previous few fights. He saw early that Molina would not crumble under 1 punch and so he stepped back and throw good, fast, hard combinations ultimately stopping Molina in between rounds late on. I do see a slight improvement in Khan from a patience point of view since training with Virgil Hunter but it will take a lot more work to improve the overall defense because Khan was still caught with punches by the slower, shorter fighter. It will take time and hard work but I think Khan can improve. I didn’t like the post fight interview in which Khan directed his aggression at Garcia and I certainly don’t think that Garcia should be his next fight! The fact is if Garcia had been the man in the ring on Saturday and had hit Khan with the punches Molina hit him with, it could have all gone horribly wrong again for Khan. Overall a good fight for Khan and rematch with Garcia down the line will be a huge fight for the fans and a good payday for them both. Not a huge amount to say about this fight to be honest. It was good to watch, very explosive and went exactly as it was expected to. Donaire simply proved that he has great speed, great power and can throw some awesome looking combinations. 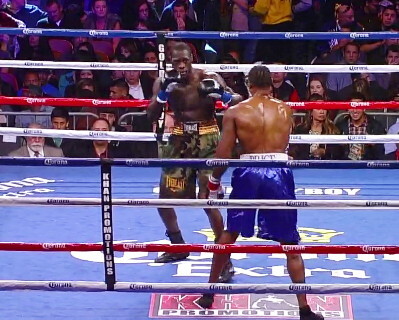 A nice left hook to finish the fight and Donaire goes marching on as we all thought he would. Wilder finally fights for at least some sort of title! He easily won the WBC Continental America’s title by stopping the hugely over-matched Kelvin Price in round 3. It was a result that I fully expected and Deontay goes to 26 – 0 without going past round 4 once again. He seemed in positive mood after the fight, bragging about himself being great and using his catch phrase “All Day, Any Day” more than once. What did we learn? Well not a huge amount other than Wilder is still shy of world class. He is a good fighter and clearly hits hard! That’s fine against a stationary target like Price who himself had a record that was a little generous to his skill level with 13 wins no defeats prior to this fight. The KO punch was very very basic, a range finder jab that fell a good 7-8 inches short of Kelvin’s face followed by a telegraphed overhand right that landed to KO Price. Don’t get me wrong if Deontay keeps fighting at this level he will do no wrong however if he steps up to contender class and world level throwing those kind of combinations he is going to find out very very quickly that opponents will easily slip the punches and land their bombs. He does remind me of another Michael Grant, he was 34-0 and over-hyped until he stepped up. He then very nearly got embarrassed by Andrew Golota, before being KO’d quickly by Lewis and McCline. I can see Deontay going the same way at this stage, but that’s just an opinion. Over all a great weekend to end the year and plenty to look forward to in 2013!! Merry Christmas to you all and a Happy New Year! !